HMK HorsesPartnersHMK UdlejningCampingvogn Hobby 560Boller RidecenterPrices and servicesOur horsesGalleryVideosContactAbout us ! At Boller Ridecenter we will keep our own horses and ponies. We currently have three ponies. Two internationally competed dressage ponies and one up and coming. We also have a homebred six year old mare, a yearling colt and an eleven year old dressage horse. HMK Horses was established in 2015 outside Oslo, Norway. 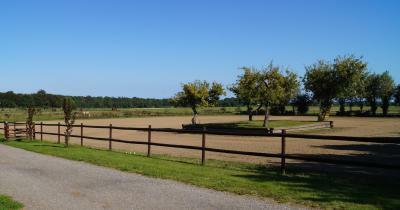 We are a small family dedicated to horses, and have recently acquired a beautiful stable with historical roots, outside Horsens at the east coast of Jylland in Denmark. From Boller Ridecenter we will offer livery and train and compete our own dressage ponies and horses. Boller Ridecenter har historie tilbake til 60-tallet, og har tidligere vært arena for internasjonale stevner. De siste årene har Equine Denmark drevet stedet, stort sett til egne hester. Fra Januar 2016 overtar HMK Horses stedet og tilbyr igjen opstaldning. Med stor entusiasme og glede ser vi frem til å skape et hyggelig miljø på ærverdige Boller Ridecenter !